Enable electrification in emerging economies that helps raise living standards, create jobs and advance human development. In fact, U.S. trade data show the value of U.S. LNG exports rose 63 percent year-over-year to $4.4 billion through the first 10 months of 2018. The U.S. was not an LNG exporter just three years ago, so this is all new value to our economy, produced by the energy revolution. Which brings us to our greater concern. 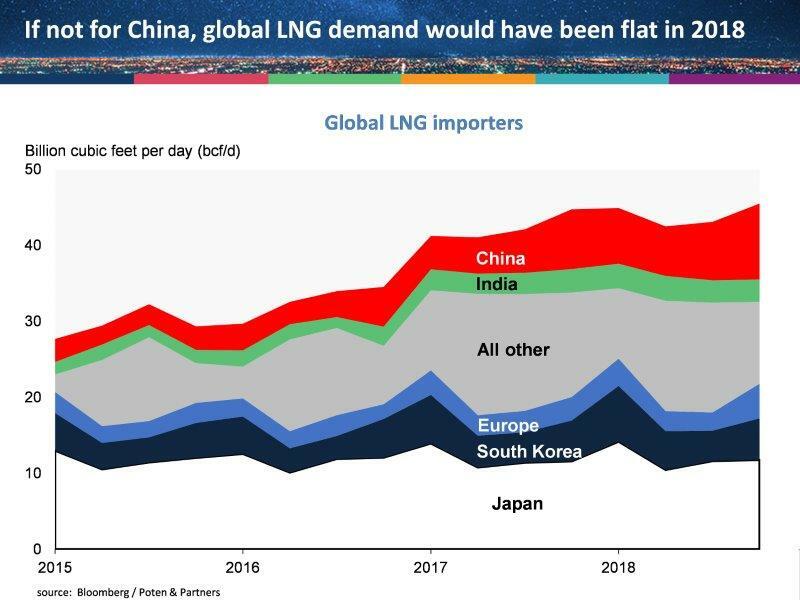 Projections may vary, but China is expected to be the major source of future global LNG demand growth, and it’s one of relatively few emerging economies with a clear need for natural gas as well as the ability and willingness to pay for it. Importantly, LNG is an industry where security of supply and trusted trade relationships are key ingredients to motivate long-term contractual arrangements that underpin the financing and development of new projects. The United States’ trade war with China could be resolved this year, and the proverbial clouds over trade relations may clear. However, if global trade fissures continue to deepen, future U.S. LNG projects and the billions in investment and thousands of jobs associated with those projects are likely to be hampered – that is, without support from the world’s largest growth market in China. If you were interested in stability of LNG supplies, from China’s perspective would you rather build additional Russia/Caspian pipeline capacity, contract for more LNG from neighboring Papua New Guinea or Australia, or sign up to buy more U.S. LNG amid a trade war? 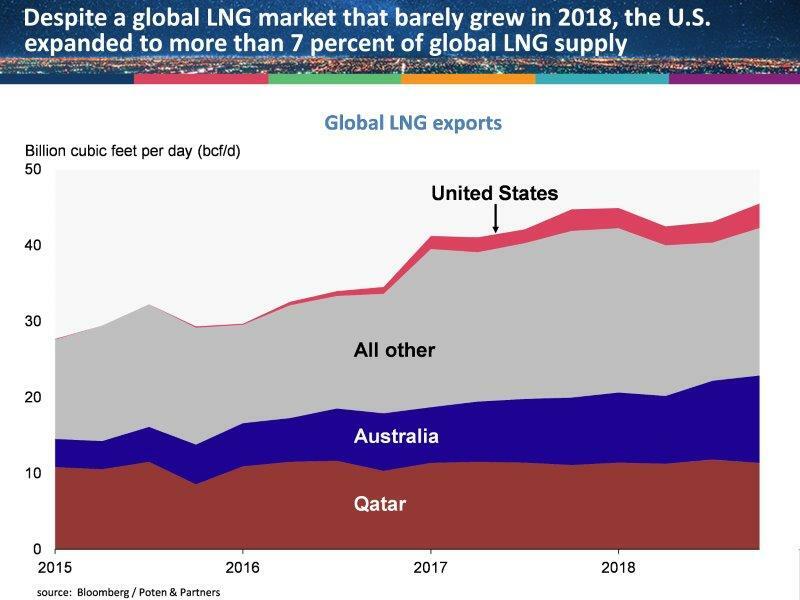 The sky isn’t falling for the United States (not yet at least), but if the U.S. wants to motivate a second wave of new LNG projects – and it should – and compete globally against other natural gas sources, then it needs a reasonable solution to the U.S-China trade standoff. Moreover, in economics-speak, this is a path-dependent game, where a credible commitment to advance a project anywhere in the world can foreclose the opportunity to move others forward in other parts of the world. As a case in point, consider LNG Canada, which took an affirmative final investment decision this past October. LNG Canada – the largest private-sector investment project in Canadian history – received backing by the Canadian federal government and tentatively locked in more than 3 bcf/d of what the U.S. Energy Information Administration (EIA) and Bloomberg anticipate may only be about 20 bcf/d of total LNG exports from North America by 2040. By contrast, U.S. LNG projects haven’t asked for handouts – only that they receive expedient FERC/DOE permitting and the ability to compete on a global playing field that is as level as possible. Unfortunately, a number of approvals remain under consideration by FERC that should be moved forward. U.S.-China trade frictions have already had real consequences in terms of LNG export cargoes, but the ultimate price may be to undermine the United States’ competitive position in the future of LNG market growth. Time will tell, but we need progress in resolving U.S.-China trade differences, with an eye on the larger prize: sustaining and advancing the U.S. energy revolution for decades to come.